Earlier today, during the announcement of the most Earth-like planet ever discovered, researchers working on the Kepler mission released an updated catalog—which now includes 521 new candidate planets. Add that to the 4,175 already discovered by the space-based telescope. Above. 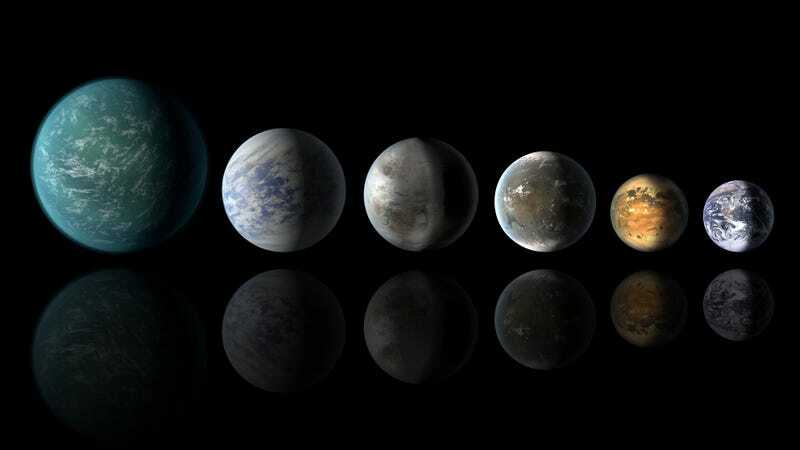 An artist’s conception of habitable-zone planets with similarities to Earth: from left, Kepler-22b, Kepler-69c, the just announced Kepler-452b, Kepler-62f and Kepler-186f. Last in line is Earth itself. Kepler is truly turning out to be an extraordinary planet hunter. The space-based telescope has now detected 4,696 objects of interest, including the new candidate planets. Confirmation of the new super-Earth brings the total number of known planets to 1,030. The data analyzed by the scientists was captured by Kepler from May 2009 to May 2013, a four year span. The new catalog—the seventh to be released by the Kepler team, and the first since January 2015—is the first to be fully automated. Typically, the first step in the planet hunting process is to find signals that show periodic dips in brightness (i.e. the transit method of exoplanetary detection), followed by a more thorough analysis in which KOIs, or Kepler Objects of Interest, are highlighted for future study. This second step is traditionally handled by a team of scientists, but that can be tremendously time consuming. But now, NASA has written an automated software program that effectively replicates this tedious process. As a result, planet hunters are able to assess all the Kepler planets in a more uniform and coherent fashion. “Now that the process is automated, we’re able to assess every single transit-like signal and do so automatically,” noted Jeff Coughlin, Kepler research scientist at SETI Institute in Mountain View, California, at a press conference earlier today. What’s more, the new-and-improved process will allow astronomers to better determine the number of small, cool planets that are best candidates for hosting life. More specifically, the new catalog includes 12 planetary candidates that are less than twice Earth’s diameter and are in orbit within their star’s habitable zone, i.e. that sweet-spot in a solar system where a rocky planet can sustain liquid water at its surface. Nine of these planets orbit stars that are similar to our sun in terms of size and temperature. That’s incredibly encouraging; astronomers are increasingly finding that terrestrial, or rocky, planets are among the most common in the Galaxy. Of the dozen Earth-like candidates announced, only Kepler 452b—the exoplanet described earlier today as being the most Earth-like yet—has been confirmed. The remaining eleven will have to be verified by astronomers in the months and years to come. Above is a visualization of the new potentially Earth-like, habitable zone planetary candidates (shown in open yellow circles). The dark green area represents liberal estimates for the habitable zone, while the light green area represents more conservative estimates. The open blue circles are candidates from previous catalogs, while filled-in circles are confirmed planets. In more good news, all the data is publicly archived—and will remain that way for years to come.